Canon’s EF 35mm f2 is a prime lens with a fairly straight-forward design utilising 7 elements in 5 groups. The 35mm focal length when used on a full frame 35mm camera is considered by many to be the most versatile ‘standard’ focal length and is suitable for landscape, architecture, reportage and many other applications. Fitted to a camera with an APS-C sensor the relative focal length is 56mm (Canon body, coefficient 1.6). This very reasonably priced lens is aimed at advanced amateurs and professional photographers. While not equipped with image stabilization or ultrasonic focussing motors the lens is still autofocus and its lack of extra refinements make it very light, coming in at 210g. The position of the Canon EF 35mm f2: well to the left and among the highest up the chart if an enviable place. 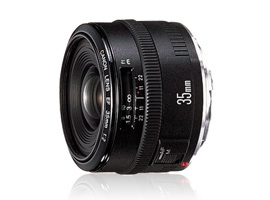 The Canon EF 35mm f2 is a no frills lens. It has a P-MPix score of 15. This resolutionsharpness score is mid range for a lens of this focal length and the scores for most of the measurements bear this out. The overall DxOMark score of 22 does trail behind its competition but it is respectable for such a cheap lens. Alongside the Samyang 35mm f1.4 AS USM and the Carl Zeiss 35mm f2 ZE which are the closest in price and specification respectively: there is not much to choose between them, but the Canon has higher resolutionsharpness than the Samyang and has lower distortion than the Zeiss and neither of the independent lenses has autofocus. The Canon lens is not without faults: wide open both resolutionsharpness and vignetting are quite poor, resolutionsharpness down to around 40% in the corners and vignetting nearly 2 stops. Both of these measures improve rapidly when the lens is stopped down, even by just one stop. It would also be fair to mention that most of the 35mm lenses tested by DxOMark for Canon have similar characteristics for vignetting and all of the others tested are much more expensive. Transmission at 0.3EV, distortion at .3% and chromatic aberration at 9µm are all well controlled and the Canon does not stand out either way against its competition. Making a comparison between the Canon EF 35mm f2 and any other 35mm lens for Canon the first and most obvious thing that appears is the price. This lens is less than half the price of Zeiss’s Distagon f2. It does not perform as well at f2 as the Zeiss but it is a little better than the Canon f1.4 and if you look at wide open, rather than comparing f2 with f2 then the difference is significant. Once you stop down to f/4 the three 2 lenses look remarkably similar. There are other measures where this budget lens has a definite advantage: weighing just 210g compared to the Carl Zeiss 35mm which tips the scale at 600g it is physically smaller too, less than half the size. Here are two lenses, one 22 years old and the other brand new, just launched. The Sigma is better in virtually all measures. It is twice the price of the Canon, but this is certainly justified given the excellent scores and the wider aperture. However when viewed side by side the Canon stands up well against this very good competition. When you consider that many manufacturers market their lenses as ‘optimised for use on digital’ this 22 year old lens seems to be an anachronism, designed for film it seems to stand up very well under digital scrutiny. This is not a great lens, but it is a good lens, it is very cheap and performs well. If you need a 35mm lens for your canon camera there are really only two that are worth looking at, this Canon EF 35mm f2, the cheapest and the Sigma 35mm f1.4 DG HSM A which is the best. The available lenses span a vast range of price and a slightly smaller range of quality but these two are clear winners with a good balance between quality and value.